Wiremold Plugmold® 1-Channel, 2000 Series multi-outlet system has voltage rating of 125-Volts and current rating of 15-Amps. This 2-Piece system accommodates conductor of size 12-AWG THHN. 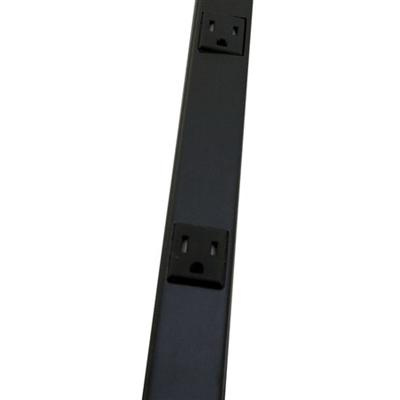 Multi-outlet system in black color, features steel raceway and thermoplastic receptacle. Built-in shutter system aids to avoid the insertion of unwanted objects including hairpins, keys and nails while rendering additional protection for occupants including small children. Multi-outlet system with 6-Inch center spacing, has six single receptacle outlets. It measures 915 mm x 32 mm x 19.1 mm. Multiple power feed options offers clean, attractive installations with concealed power sources. System is surface mountable. It is well suitable for residential applications and offers immense protection against burns as well other injuries. Multi-outlet system is cULus listed, RoHS compliant and meets NEC standards.